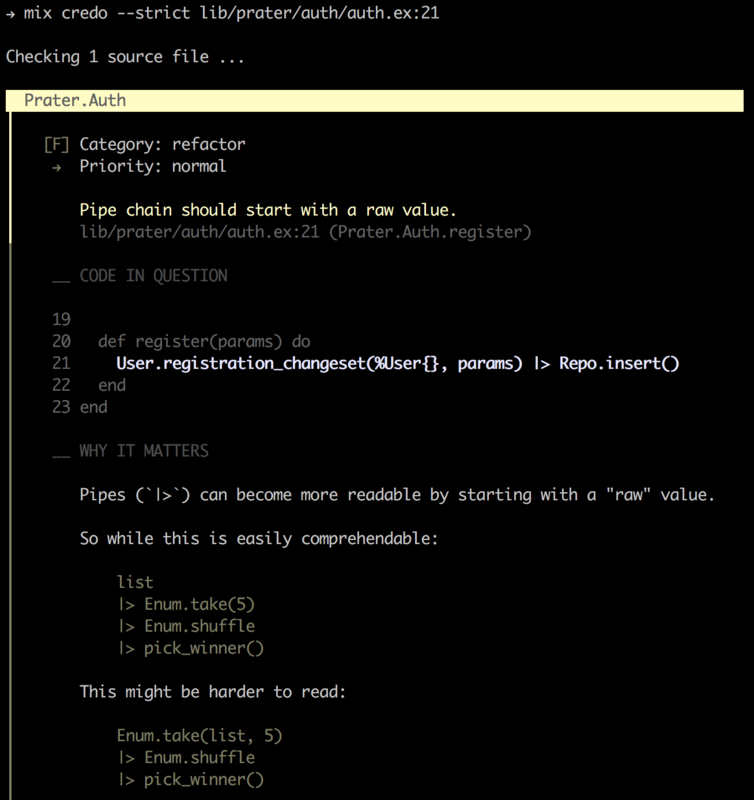 At the beginning of my Ruby on Rails career, I was using the “Rails Best Practices” code metric tool. The intent of the tool is pretty simple. It provides you suggestions how to improve your code. The best part of it, that on the https://rails-bestpractices.com website I was able to find detailed instructions why and how to fix those issues. I love that tool. I was using it every day to check my code. The cool part about those suggestions that I can go and read an explanation of that issue on their website. I was using the tool mostly for learning stuff. Now it’s time to learn some Elixir. And today I would like to discover a similar tool “Credo”. Credo focuses on teaching and code consistency. First, we can install Credo as a dependency to our project. Then mix credo will be ready for our use. Once we run that analysis tool against our codebase. Credo would provide us bunch of issues and suggestions on how to improve the codebase. Now let’s try to run it for our project. For the examples here I would use the “Prater” application. You might know about it from my previous posts. First, let’s run the default task and see the results. In my case, it provides me a list of 14 issues. I can see the summary of it at the very bottom of the output. 101 mods/funs, found 3 refactoring opportunities, 11 code readability issues. We can also run it using strict mode. 101 mods/funs, found 3 refactoring opportunities, 25 code readability issues, 23 software design suggestions. This time I’ve got the list of 51 issues. Looks like it’s way more strict. it does not make sense to go through every single issue in that article. Thus, let’s pick a single file and try to work with it. A single file would be enough to walk through it and figure out what does every issue mean. 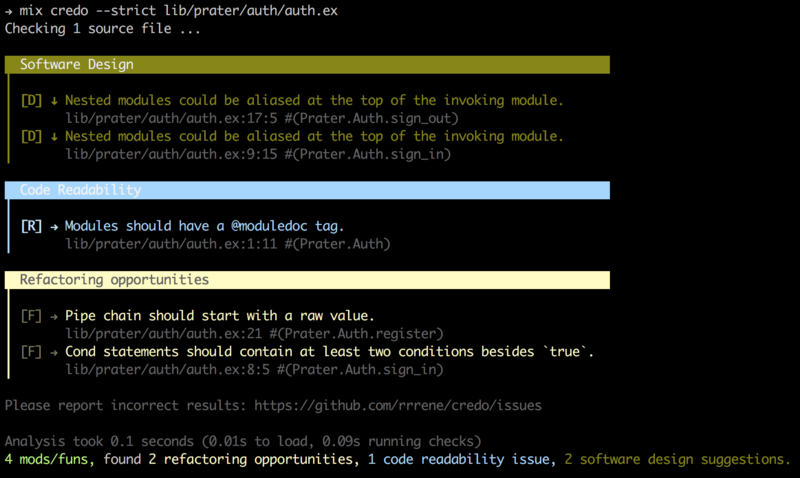 Here we can see what do we have after running default credo task for the lib/prater/auth/auth.ex file. And now the results for the same file but with the strict mode. We can see, now we have “Software Design” category in addition to that we had before. If we try to read through the issues, we can understand that do they mean. For example “Modules should have a @moduledoc tag.” is a pretty descriptive by itself. On the other hand, “Pipe chain should start with a raw value.” may require additional explanation. We can see that we have way more information. Credo shows us the exact line of our code and bunch of suggestions. that issue will be gone. [F] → Cond statements should contain at least two conditions besides `true`. "always true" statement. Otherwise an `if` and `else` construct might be more appropriate. I think we can agree with Credo about this one. Let’s update it to use if/else instead. And yet another issue fixed. In the end, can we use Credo to learn something new about Elixir and how to format the code? I think we can. 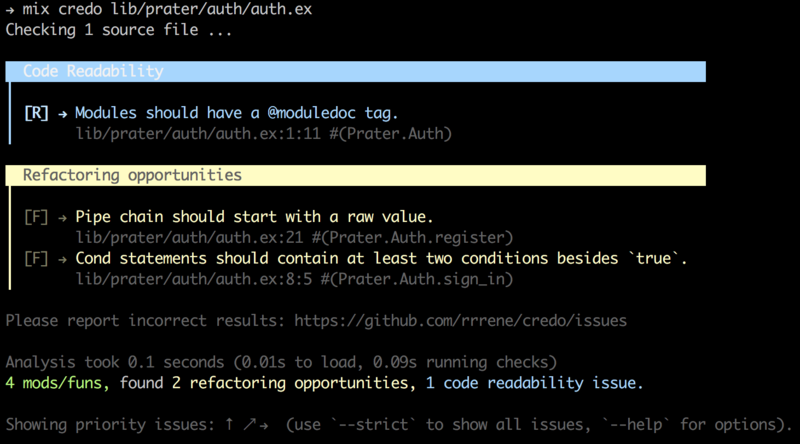 You can go even deeper and run the credo check from your CI tools. If there are any issues Credo would fail with the non-zero exit status. That can make your CI build to fail and force you and developers in your team to fix the issues. 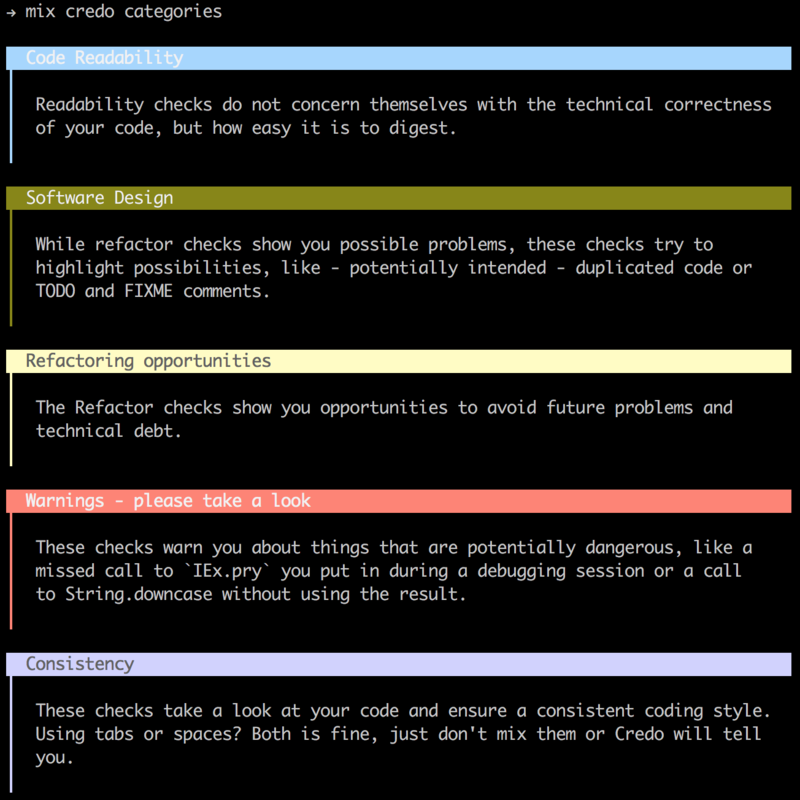 In any case, I encourage you to try the tool against your code and check how can you improve it. You can find more information about Credo on the GitHub page.